Centrifuges are used for separating solid particles from the fluid of different density, for example for cleaning oil in drilling waste fluids. High rotation speed of the rotor creates large centrifugal forces, pulling heavier particles to the side of the rotor, where they stay until removed during a regular maintenance, or from where they are removed continuously by a special mechanism. Frequently, the rotor of the centrifuge is driven by a separate electric motor, or by a shaft from the car engine. GN Solids Control, with a separate U.S. brand GN Solids America, is a professional manufacturer on different size of decanter centrifuges. The centrifuge size varies from 9 inch to big bowl 30 inch to meet the application of different field. GN design and make both 2-phase decanter centrifuge and 3-phase centrifuge for industry separation. What is a 2-phase separation decanter centrifuge? 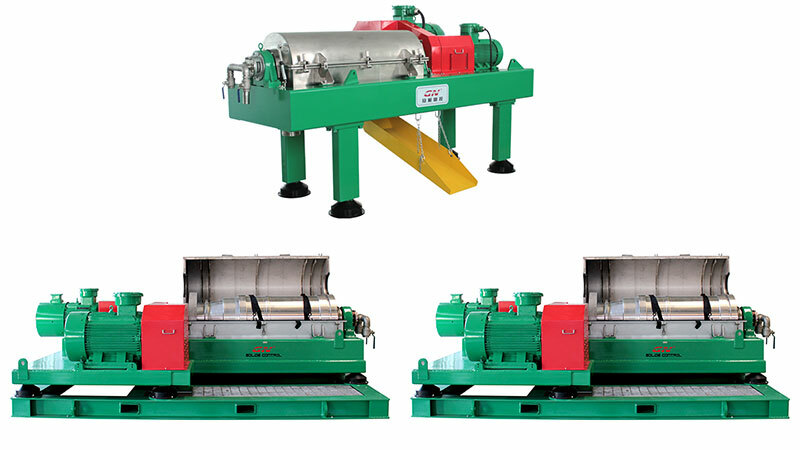 2-phase separation decanter centrifuge can used to separate solids or soil from the solids liquid mixture. The final products are solids and liquid mixture. If the clients want to get separate oil and water, they will use an oil water separator after it. What is a 3-phase separation centrifuge? 3-phase separation centrifuge is widely used for oil water separate. They can separate and get the 3 phase final products: oil, water and soil. For a better separation result, 3-phase centrifuge cannot allow high solids content. Normally it will be used after a decanter centrifuge. A 2-phase centrifuge will be used to reduce the mud weight first. And then the liquids transfer 3-phase centrifuge. GN Solids Control makes and designs centrifuges per the specified tasks and application requirement. All material of GN brand centrifuges are only chosen from high standard and famous brands. GN Solids Control own the full line advanced centrifuge processing machines. All these ensure GN made centrifuges are with optimized performance. Moreover, GN owns a branch for design PLC and electrical control system; this gives GN advantages in electrical components for measuring and control technology. The performance and availability of the decanter centrifuge or three-phase centrifuges are significantly improved by the control system.